I first heard Michelle Otero read her poetry at Speak, Poet, an Albuquerque, NM poetry reading for Latin@ and Indigenous voices where I was welcomed into the fold by the group’s founder Andrea Serrano. I’d been looking for a poetry group when I first moved to New Mexico from California in 2011, and at Speak, Poet I found a home. And in Otero’s poems about her familia and her experiences sharing poetry with the elderly, I found beautiful truths and inspiration. Then last year, Andrea invited me to watch Hembras de Pluma, a collective of talented women playwrights and actors, perform at The Hispanic Cultural Center, and I was so excited to see Michelle Otero performing a moving piece she’d written about how she’d lost (and found) everything when her apartment burned to the ground while she was away living in Mexico. I began following Michelle’s blog, in which she writes about her experiences as a stepmother to two preteen children, and again found such inspiration, such resonance in her stories that I knew I needed to ask her more. (Here she is speaking at TEDxABQWomen). 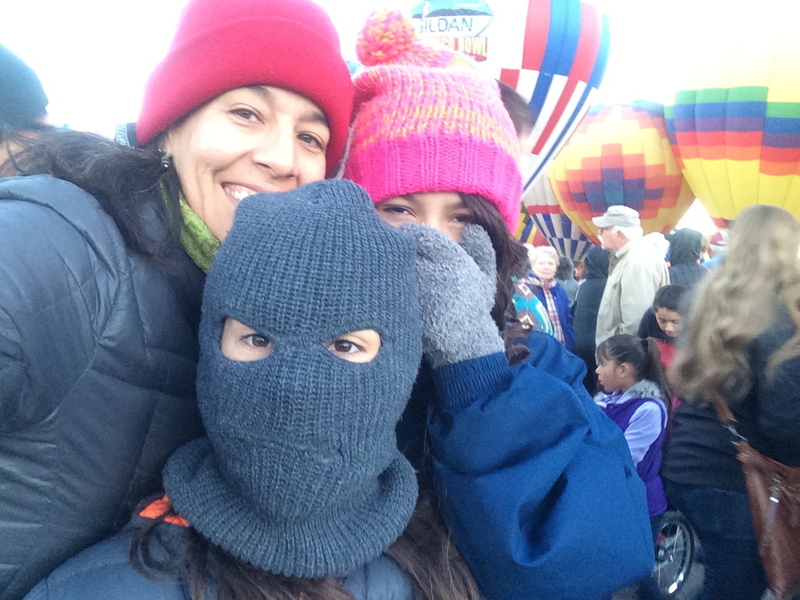 It’s my honor to share this interview with Michelle in which she speaks about her life as a Latina writer and stepmother who came to mothering unexpectedly, and I’m sure you’ll be as moved as I am by her words. 1. Was being a mother always a goal/desire for you, and was being a writer always a goal/desire for you? How does the reality of being a mother-writer compare with your expectations? Being a mother wasn’t so much a goal or desire as an assumption. Except for an aunt who married into the family and a woman named Maggie who went to our church, every brown woman I knew was a mother, and all of the mothers I knew were also wives, women who married young and worked as bank tellers or secretaries or—like my mom—as teachers. In my twenties I wanted to be a mother more than I wanted to be a wife. My baby was a little girl strapped in a rebozo against my chest. She had hazel eyes, slept through the night, spoke flawless Spanish, and picked flowers from our garden for me to wear in my hair. She was a chance to get things right, to erase any mistakes I had made. The fantasy persisted into my thirties. That vision of myself as a single mom who would take in lovers now and then had little to do with my preparedness for motherhood and everything to do with my relationships with men. The writer fantasy was my real life in Oaxaca while I was on a Fulbright Fellowship in my early thirties. It’s how I wrote Malinche’s Daughter and completed my MFA program at Vermont College. I had solitude, a sunny apartment, a walkable city right outside my door, a community of women who wrote with me. I finally learned Spanish. It was a dream. Reality on the mother and the writing front is—no surprise—much harder than fantasy. With the kiddos, I expected to be challenged by the face time, the sharing of physical space (what to pack for lunch, discipline, sleep deprivation, homework), but I was—and still am—shocked at the mental space now occupied by the children, this whole other layer of responsibilities. What do we do with them this summer? Is she old enough to have a boyfriend? Why does he cower from medicine like it’s acid? What do I do with their baby teeth and locks of hair? I can—and have—spent entire days dwelling on the questions, not writing, convincing myself that it’s for the good of the children. Thinking about parenting is a lot like thinking about writing. It’s a waste of time. I get more out of doing and reflecting with intention. 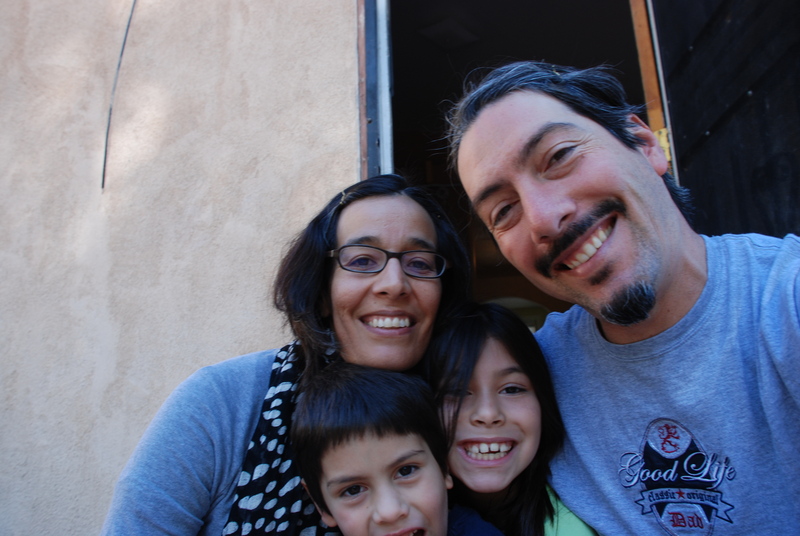 On the writing front, I had a hard time letting go of Oaxaca, and in some ways my longing for what I had then has kept me from appreciating or even working with what I have now. In some ways my writing got shaped as a defensive act, writing of abuse and violence against women, telling the stories that our community is afraid to tell. Loving felt the same way. (I am thinking of a line from “Hallelujah” by Leonard Cohen: “Maybe there’s a God above, but all I ever learned from love is how to shoot at someone who outdrew you.”) I have learned more than I thought possible about how to love through my relationship with my husband and his children, as individuals, and as a unit. And I am learning how to bring some of that love into my writing, to make it an act of radical self-care, radical acceptance. Until very recently, mothering and writing felt like they were at odds. My life with the kids could be fodder for my blog, but any “real” writing had to happen when they were at their mom’s house or in school, and even then my carefully constructed solitude could fall apart with one call from the school nurse or a forgotten dentist appointment. And then it came time to write a piece for Hembras de Pluma, a women of color theatre group composed of actors and poets. For the past two years we have written and performed an evening of original short plays and monologues. I knew I wanted to write something about being a stepmom and had been writing a short poem here, a journal entry there. What surprised me in the process was my ambivalence toward having children of my own, recognizing that what I kept coming back to when I thought of never giving birth was a deep fear over who would care for me when I am old. The writing process unearthed this belief that women who don’t give birth end up alone with no one to love them. On the surface, “Mother Lode,” the piece I wrote and performed, is about being a stepmom, but really it’s about coming to terms with not birthing my own children. I didn’t know that when I started writing the piece. My wrestling with motherhood was happening in real time along with an intense physical process of healing years of back pain, starting in my non-child-bearing hips, and working up my spine. I’m happy to report that I can now envision a pain-free spine, and more importantly, that the hard-won conclusion I reach in “Mother Lode”—that this is the life I was meant to live, these are the children I was meant to mother—is the same conclusion I’ve reached in real life. That wouldn’t have happened without the writing. 3. Have you found that there are particular challenges facing mother-writers than those of other writers? Before I was thrust into parenting (short version of story: in 2009, after H. and I had been dating about a year and half, my apartment was destroyed in a fire, and I came live with him and his two kiddos), the writing challenges were in my head, which didn’t make them feel any less real, but had more to do with fear, with getting over myself enough to sit down and write. There were some challenges around the seemingly mutual exclusivity of money and time. Mothering has given me a convenient excuse for not writing, but it’s also made it more important now than ever to write. Everything is better when I write. Everything. My health, my sleep patterns, my relationships, my ability to be present to the kids, my capacity to accompany them through their own stuff. We hold mothers to very high standards. My mom taught elementary school, raised five of us, cooked, and kept the house spotless. I hate cleaning the bathroom. I enjoy cooking, but the pressure of generating a new meal for kids who don’t like vegetables has sucked any pleasure I might derive from that experience. And so we have domestic help. H. cooks. I manage laundry and the budget. And still, the house is messier than I’d like it to be. The kids don’t automatically clean up after themselves, and I feel bossy saying every morning, “Make your bed. Put your clothes in the hamper. Is that your glass on the coffee table?” I have to remind myself that we came into each other’s lives after many of their habits had been formed. They’re learning to turn off the lights when they leave a room. I’m learning to focus on the big picture: Are they good human beings? Do they have a relationship with their emotions? Are they happy? Are they kind? I have to remind myself we spent our time outside with friends when I was a kid. Our parents didn’t make us snacks or arrange play-dates or clean up our messes. We were responsible for our own entertainment: bike-riding, roller skating, lizard hunting, dirt clod wars in the mesquite bushes. It’s different now. Children don’t have the freedom they once did. Neither do parents. Those opportunities for them to explore, to wander away from us have to be cultivated. Sometimes they just happen, and I welcome those times, not just for the solitude and the quiet l need, but for the freedom and room to explore that all children need. 4. As a writer of color and a mother, do you ever feel that you are breaking any barriers? Can you share any experiences you have with this? The barrier breaking came early in life for me. Leaving Deming, New Mexico for Harvard at 18. Living and working in Belize as a Jesuit Volunteer for two years right out of college. Writing about violence against women in our families and our communities. By comparison, writing and helping to raise two children feels blessedly normal, something grounding and stable. Before I landed in this family, I lived my life in two to four-year cycles, moving from place to place, starting projects here and there. I formed deep friendships, fell in love with charismatic and charming men, did meaningful work that taught me the healing power of community and creative expression. I learned Spanish, my parents’ first language, the one they held from my brothers and me because they wanted to spare us the pain they’d endured as brown kids in a white school system. I loved that time in my life. I remember the giddiness I felt walking through the zócalo in Oaxaca on a Friday afternoon, my turquoise skirt, my red huipil. I couldn’t believe my good fortune. Now I have a mortgage, a husband, two kids, a cat, two dogs, neighbors who call over the fence or from across the street, a garden with Tarahumara sunflowers, Ghost Ranch pintos, and calendula. Now the barrier I am breaking is not about leaving home, but about creating it, committing to this family, this street, these neighbors, this place. It’s shifted how I think about my creative and community work, made me accountable to someone other than myself. 5. Tell us about your work in the community, with theater, and what’s next for you. My work is all about storytelling, telling my own, helping others tell theirs, and applying those stories to program, community, and economic development. I am stepping back from theater for the summer to focus on writing part one of a three-part, one-woman theatre piece about home: leaving it, losing it, and recreating it. I wrote and performed excerpts of part two, “The New Normal,” for last year’s Hembras de Pluma production. It deals with the fire that destroyed my apartment in 2009 and my sudden transition from solitary writer to stepmom. 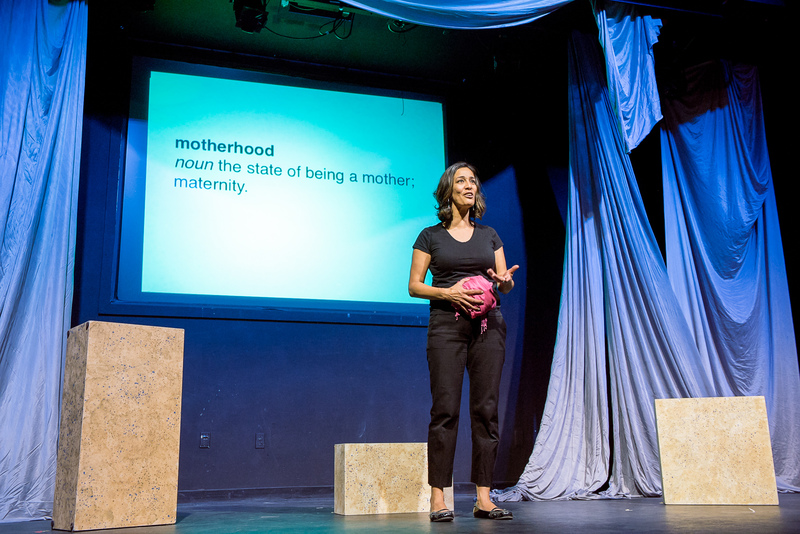 I debuted part three, “Mother Lode,” about motherhood and stepmotherhood as part of this year’s production. Part one is about being a young, brown, working class girl from Deming, New Mexico at Harvard. Together with poet Valerie Martinez and writer Shelle Sanchez, I am developing a creative community engagement project bridging the Barelas and South Valley neighborhoods, to launch in January 2016. I am working with a group of poets, visual artists, and filmmakers who engage in creative community expression to develop a cooperative that would provide administrative and other support to working artists. This has been a two-year labor of love that is finally taking shape. More to come as it evolves. I also serve as a coach/mentor for the New Mexico cohort of W.K. Kellogg Foundation Community Leadership Fellows. 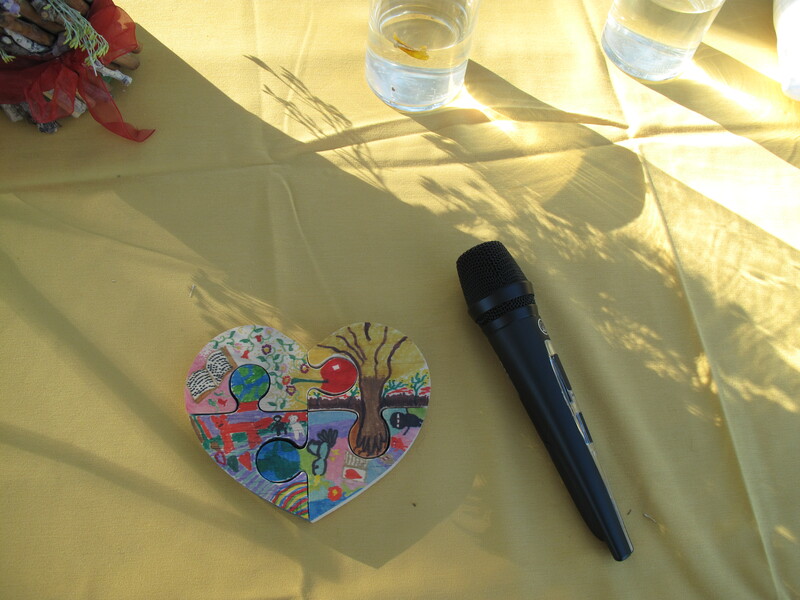 This work helps me to see the many applications that story and shared creative expression can have in our communities. It’s an enormous privilege to accompany this group of New Mexico leaders. 6. Have you any advice to share with mother-writers and/or writers of color who may be struggling to continue their craft or to find the path toward publication?